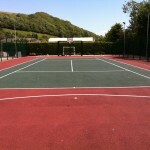 We can supply and install various types of multi use games area surfacing for many facilities across the UK. This could be a hard court like macadam or polymeric rubber, or maybe a synthetic turf pitch depending on which sports the area will be used for. Each of these has unique qualities which are suited to different sports, but we’ll be able to advise you on the best design for your facility. Make sure to contact us if you would like some more information on all of these products and we’d be happy to help. You can fill in the quick enquiry box and give us some details about your project and one of our experts will get back to you. Porous Macadam – This can be installed as either Type 1 or Type 2 macadam, both are very similar but Type 2 has higher slip resistance qualities and is therefore more suited to netball. Macadam is a low maintenance surface however it is important to carry out regular cleaning to keep it in good condition. 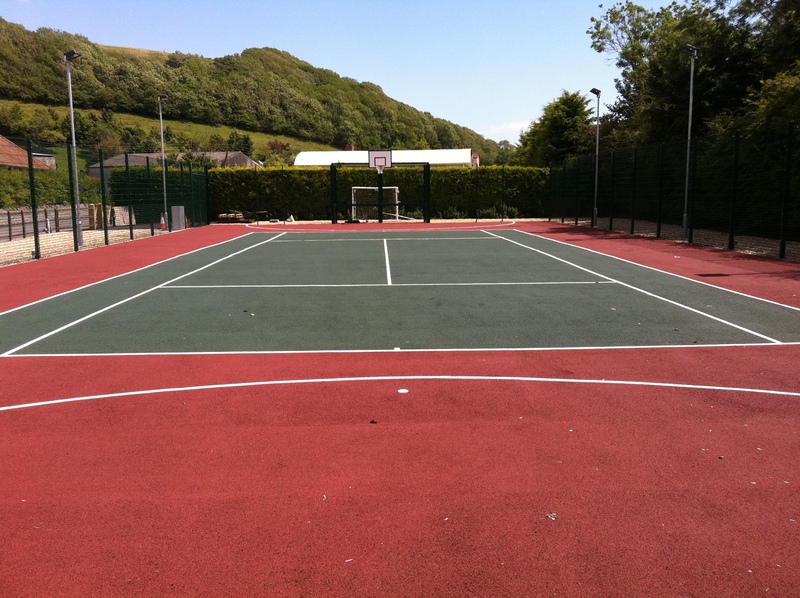 Polymeric Rubber – This can be installed as a Type 3 or Type 4 MUGA floor which is ideal for tennis, basketball and football. 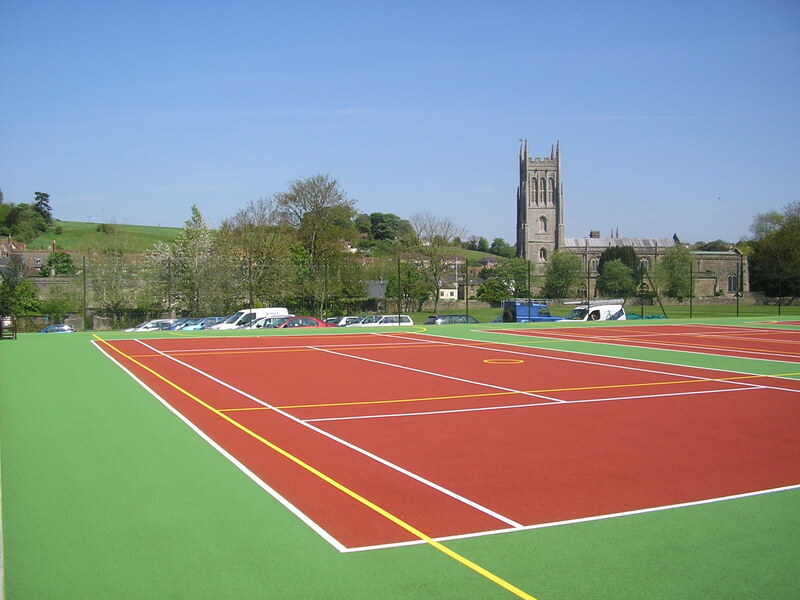 Polymeric rubber is one of the most popular multisport surfaces for schools as it provides a facility with good drainage which can be used all year round and in all weather conditions. 2G Synthetic Turf – Depending on the sports you want to play, this can either be sand filled or sand dressed artificial grass surfacing. Sand filled is great for activity such as football and tennis, whereas sand dressed provides ideal ball roll qualities for hockey. 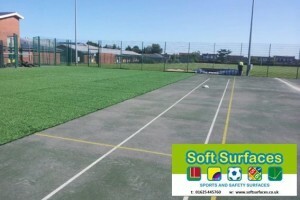 3G Artificial Grass – This is a synthetic turf carpet which is infilled with silica sand and rubber crumb particles to provide natural playing characteristics. 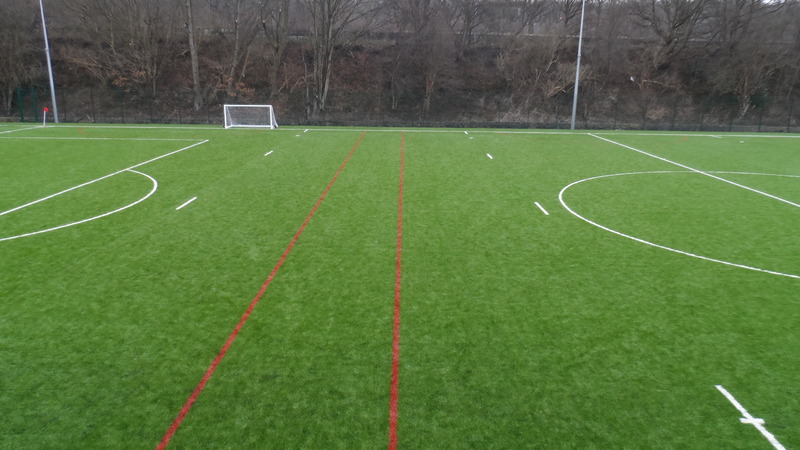 3G synthetic grass is ideal for playing football and rugby as it gives good shock absorption and is comfortable for players’ joints and muscles. The advanced NBS specifications of 3G artificial grass carpet are all installed to FIFA standards for safety and performance when playing football. The costs and prices of installing surfaces can vary greatly for each different construction project. 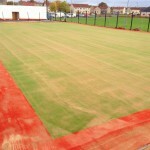 Factors which can affect the sport surface installation prices include the surfacing specification, the area size, site location and the additional applications and equipment you choose to install. Professional line marking and acrylic colour coatings can be applied in contrasting colours to give floors an aesthetically pleasing finish and a surface that performs well. Additional equipment such as fencing and floodlights can also be installed to complete the overall MUGA construction; however prices for these extras can be negotiated to help keep the project within your budget. We pride ourselves on giving excellent service and providing top quality results for all of our projects, we can install a multi activities facility which meets your requirements and come at an affordable price. Our aftercare service also ensures that your multi use games area surfacing stays in top condition for as long as possible as we can offer a cleaning and maintenance programme to help improve the durability and longevity of the facility. This important maintenance can cut costs for your organisation by ensuring the need for repairs and resurfacing of your court is kept to a minimum. Please don’t hesitate to get in touch with use if you need more advice and information on multisport flooring. 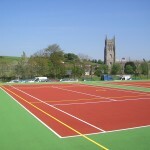 We are able to send you over product sheets and case study examples of our range of MUGA surface types to help you choose the perfect specification for your sports facility. Fill in our contact form with your details including a site location and area size for the project and we’ll get back to you with information on prices and designs for your activities facility. 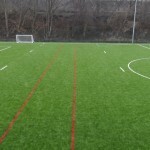 This video below shows the construction of a polymeric pitch that we carried out in Stockport. 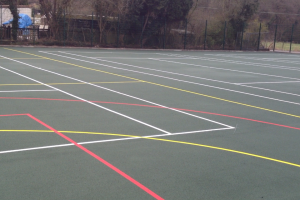 The court was installed with blue rubber surfacing with multi coloured line markings for a number of different activities including basketball and netball. Polymeric EPDM rubber is a popular surface type for this kind of sport court because it provides ideal slip resistance and ball bounce qualities for the chosen activities. 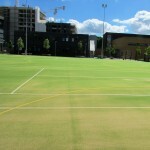 Our installers commonly build courts facilities in synthetic grass for use with football and rugby. 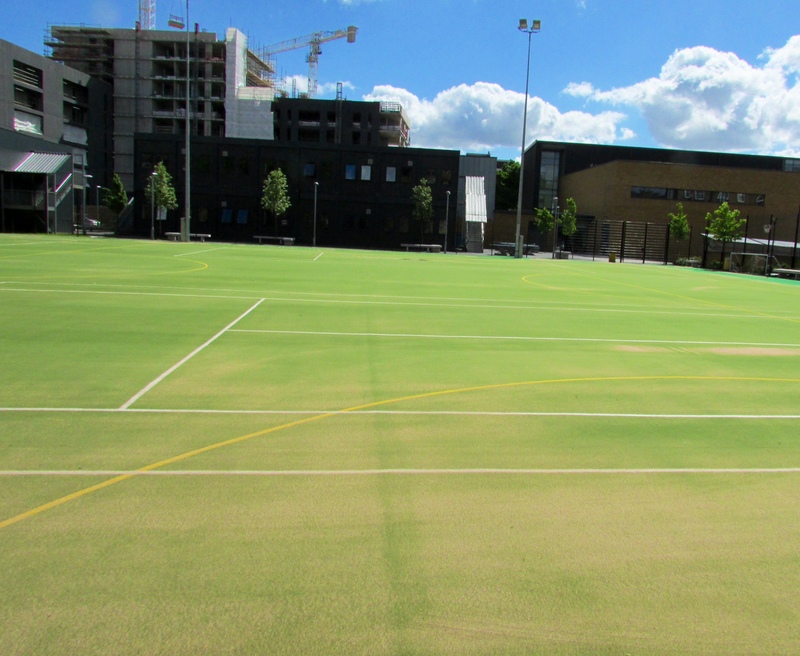 The next video shows the installation process for one of these artificial pitches at a school in London. Our team carried out the full project including preparing the groundworks, installing a stone sub base and laying the chosen carpet. Inlaid line markings were also added to the pitch for clear scoring in training and matches. The construction of synthetic multi use games area surfacing for football and rugby has become more popular in recent years due to technological advancements in the artificial carpet. Improved performance and drainage qualities mean that artificial pitches provide natural playing characteristics without needing as much heavy maintenance as real grass surfaces. 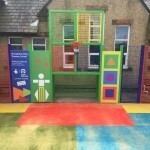 Please take a look around the rest of our website if you need any further information on the MUGA specifications or any of the other sports surfaces that we are able to install for schools, clubs and private facilities in the UK. You can contact us today by filling in the enquiry form and letting us know what you need with regards to multi use games area surfacing. One of our experts will get back to you as soon as possible to discuss all of the options and the costs for this work. Our prices will depend on the specification you choose and the existing site conditions, but please feel free to ask if you have any further questions.